Aegina Town is the capital of the Saronic island of Aegina, located on the NW coast of the island. Although many Atheneans visit Aegina for weekends and holidays, the island is not a victim of mass tourism, and continues to be a popular destination for the 'independent' traveller, as you can walk around most of the town within an hour. Most visitors arrive by sea from the port of Piraeus, taking 40 minutes by the 'Flying Dolphin' and approximately 75 minuites by the regular ferries. Aegina is famous for its pistachio nuts, the islands main export, but the reason most people visit the island is to enjoy the traditional atmosphere and hospitality offered by the town's inhabitants. Aegina has a special place in Greek mythology and history, and was a great rival to the sea power of Athens in the Classical period. 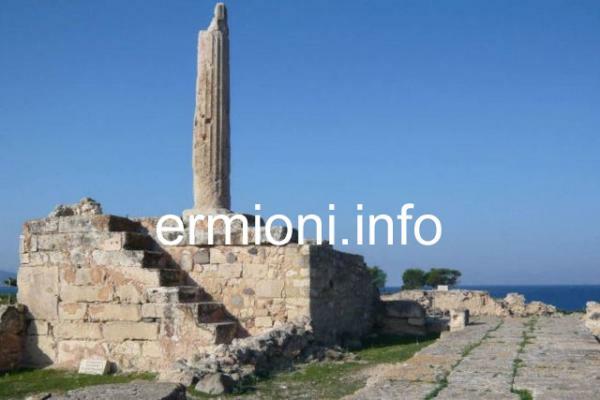 According to the ancient historian Herodotus, Aegina was originally a colony of Epidavros and the first ancient city to mint its own coins in the 7th Cenury BC. In recent times, Aegina became the temporary provisional capital of Greece from 1828-1829, during the Greek War of Independence against the Ottoman Empire. The capital was then moved back to Nafplio in 1829 and finally to Athens in 1834 by King Othon, the first King of Greece. Aegina has many places of interest on offer to the 'day visitor' as well as someone staying for a number of days or weeks. You will see the chapel of Aghios Nikolaos Thalassinos (picture above) dedicated to the patron saint of sailors, which is located on the main harbour as you arrive at the port. Within the town itself, you will discover many classical buildings and churches that line the main waterfront as well as many traditional areas set behind the waterfront like the Fish Market, close to the Town Hall, which is next to many old authentic Greek-style kafeneons and fish tavernas offering tasty fresh fish and sea food. 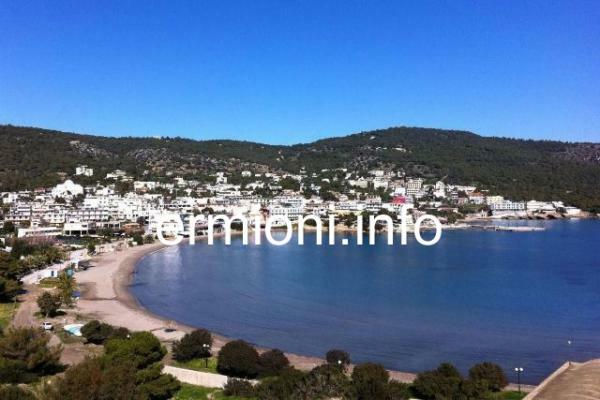 A 10-minute walk North from the harbour will bring you to the archaeological site of Kolona. 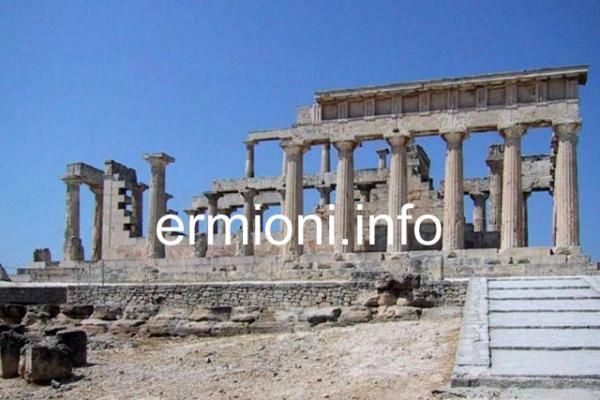 A single column (kolona) is all that remains of the Doric temple of Apollo built in 520 BC. which was first excavated in 1811 and most recently in 1966. 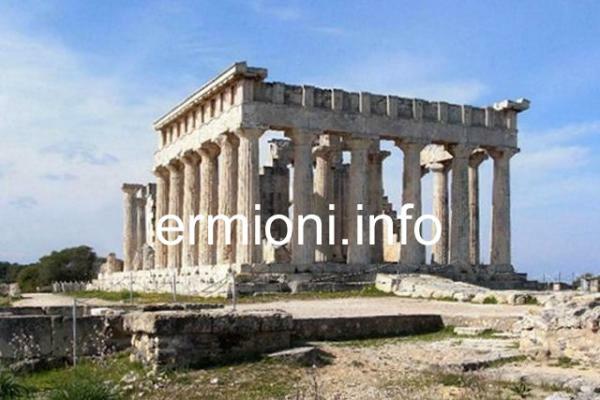 There is also a National Archeological Museum which openned in 1981, although the original museum dates back to 1828. The Kolona site (picture left) is open 08:30 - 15:00. Closed on Monday. Admission: 3 Euros. From Aegina Town there is the K-TEL bus, or taxi, that can take you East across the island to the longest shallow sandy beach on the island at Aghia Marina. 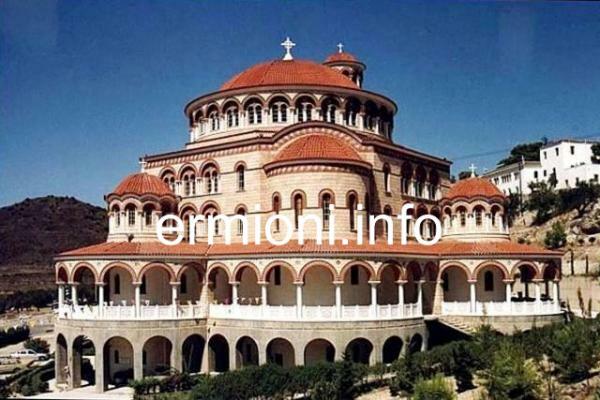 On-route you will come across the recently constructed monastery and church of Aghios Nektarios, named after the miracle-working Saint who died in 1920. Adjacent to the monastery there is Medieval Peleachora, which was the islands' capital from the 9th Century, due to the city of Aegina being destroyed by Saracen pirates, until the early 19th Century. 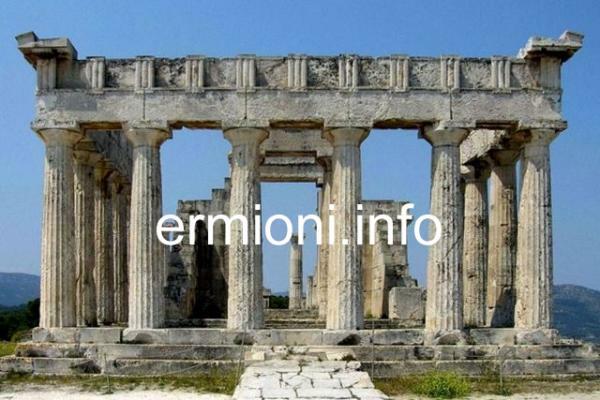 A little further towards Agia Marina, will bring you to the 5th Century BC Temple of Aphaia. This Doric temple (picture above right) was most recently excavated from 1967 to 1984 and still has 24 out of its 34 columns still standing. Site open 09:30 - 16:00. Closed on Monday. Admission: 4 Euros. During the Summer months only, Hellenic Seaways offer a shuttle ferry service sailing from Poros - Methana - Aegina - Piraeus. 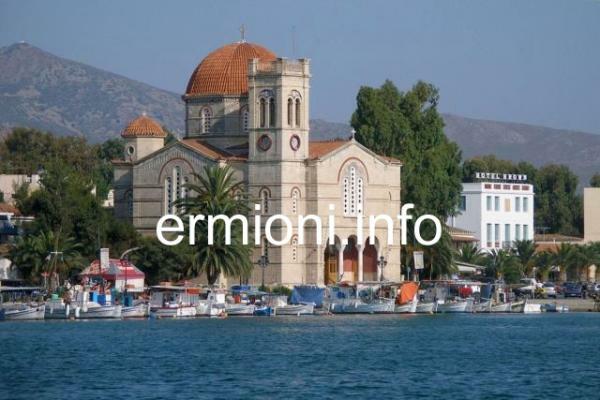 From Ermioni you will have to travel by sea or road to Poros, then sail on the shuttle ferry to Aegina. 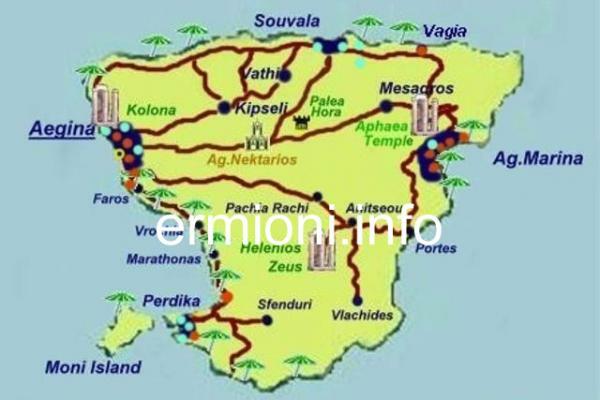 The return journey would be made in reverse from Aegina to Poros, then by sea or road to Ermioni. The journey is a relaxing all-day event which gives you about 2.5 hours on Aegina, sufficient time to explore the town and enjoy a quick meal. 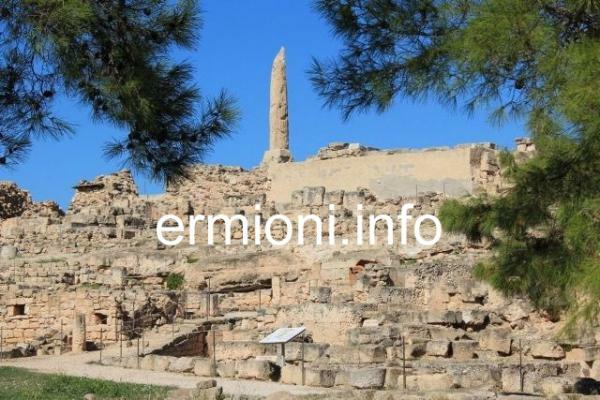 However, if you wish to visit the places of interest above, we recommend that you stay overnight, enjoy a relaxing evening and return to Ermioni the following day.